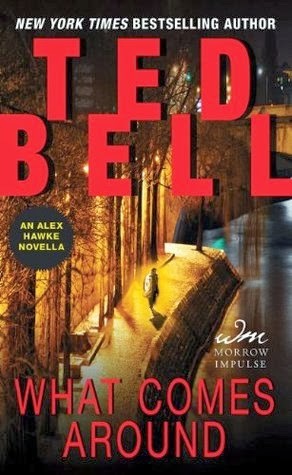 In preparation for next month's Warriors, the eighth full-length Alex Hawke adventure, What Comes Around is a short novella from Ted Bell that shows what happens when our favorite MI6 operative has a well-deserved vacation ruined by an ex-CIA agent's thirst for revenge. It's been a long time since I've read an Alex Hawke novel, so it was nice to catch up with him on a small scale before the next book. This was an interesting read. It lacks the scope and scale of the adventures we're used to, but it still manages to capture the customary humour, adventure, and drama. It also raises some interesting questions about the spy trade itself, and about the ethics involved in the war on terrorism. The plot here is simple - when high ranking officials with ties to the CIA start dying, each of them the victim of what seems to be an unfortunate accident, Alex Hawke sets himself out as bait for the killer. In an uncharacteristic twist, Alex goes into the situation far too cocky and far too relaxed, and ends up really having to battle for his life. If you've never read an Alex Hawke adventure, this serves as a good introduction. He's very much a James Bond type hero, with a touch of Bruce Wayne thrown in, who balances action, politics, and personality in the sort of adventure that is sure to appeal to fans of Vince Flynn or Clive Cussler. What Comes Around is a fun, quick read, and a great way to whet the appetite for Warriors.